"This is the place where everybody knows your name. Located a half- block off Boulevard, Moore Street Café is just a base-hit from the Diamond. Weekday workers in Scott’s Addition have pulled up chairs for breakfast and lunch on the same site since the mid-20th century. 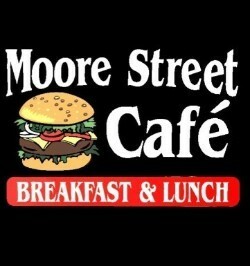 For several years Moore Street Café has continued the tradition of providing solid sustenance to an appreciative clientele. Marked by cheerful teal awnings, Moore Street Café is the classic diner of yesteryear, where you can order a cold plate or a gut-bustin’breakfast, walk out full and satisfied, and still have some change in your pocket. Owners Amy Quidley and Charlie Hughes insist on the freshness and consistency that come with home cooking: burgers are hand pressed, desserts are homemade, and the sausage gravy is made the way your granddaddy liked it. 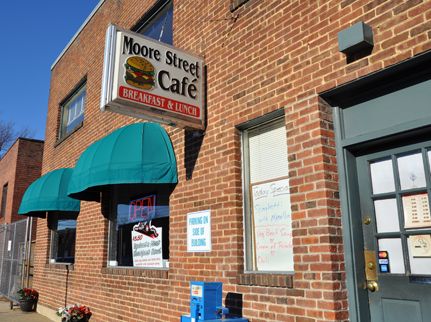 Moore Street Café also offers a wide variety of homemade salads, including chicken, tuna and egg salad, as well as macaroni, potato salad and cole slaw. Come see use ya'll! !